This version of Merriam-Webster's Collegiate Dictionary, Eleventh Edition (print only), has a laminated hardcover. For this new edition, America¡¯s largest staff of lexicographers made more than 100,000 changes and added more than 10,000 new words and senses, such as 'convergence', 'Frankenfood', 'phat', 'psyops', and 'vermiculture'. The Eleventh Edition also features over 40,000 usage examples ¡ª more than ever before ¡ª which clarify confused or disputed terms. Additionally, thousands of phrases and idioms help distinguish vocabulary for language learners. Special sections include A Handbook of Style, An Essay on the English Language, and Signs and Symbols. Over 55 million copies of Merriam-Webster's Collegiate Dictionary have been sold, spanning a time period of over 100 years. This is a very high quality collegiate dictionary. I am a member of a word puzzle organization ... and this is our standard reference, along with the unabridged version, "Webster's Third New International Dictionary". Many very obscure words show up in puzzles, but it is relatively rare I find I have to go to the unabridged dictionary to look them up. In addition to being thorough (with excellent sections such as biography, geographical names, and foreign words and phrases (such as "en plein jour" or "inshallah") it includes compressed but informative etymological data. For example, the entry on "spacious" has this - ME, fr. AF spacioux, fr. L spatiosus, fr. spatium: space, room (14c)"; in a little over a single line you get a long lineage; though I should mention that this has been slightly corrected since the tenth edition of this dictionary. You may have to learn some of the abbreviations (Middle English, Anglo-French, 14th century) but I found them generally intuitive and didn't need to look them up much at all. In addition, there are excellent usage paragraphs scattered throughout. These are of two types. One type compares the usage of different words with very similar meanings. For example, the entry on "satiate" provides a usage paragraph that compares "satiate", "sate", "surfeit", "cloy", "pall", "glut" and "gorge", identifying the precise differences of usage between them. The paragraph is cross-referenced at each of the other six words, so you don't have to just stumble across satiate to find it. The other kind of usage paragraph discusses correctness. A good example is "hopefully", which in its sense "I hope that" is controversial. The dictionary asserts the validity of this controversial use, which is sure to annoy some purists, but it does acknowledge the debate and cite grammatical arguments for its position. There are quite a few new words (my favourite is "dead-cat bounce") and edits to all sections. The only major change, though, is that the abbreviations section has been eliminated; abbreviations are now included in the main body of the dictionary. This dictionary, MW11 for short, may be the first to list bubkes, coscenarist, or MEGO. Entries now appear in a sans-serif font, basically an improvement, though the abbreviation for Illinois looks absurd. The cover claims 10,000 new words and meanings, including long ball, peloton, rabbit-eared bandicoot (who would seek that under r rather than b? ), dance card, megapixel, qi, ki. So what is missing from the previous edition, MW10? An informal survey of a half dozen pages shows that practically nothing of value is gone (lonelily, pein, Daoist are deleted). Changes include a few new senses, illustrative quotes, revised definitions, and antedatings. The entry for -er now shows beautifuller with double l, in concord with the entry for -ful. There are about 70 more pages; MW10 had only about 5 more than MW9. The total number of entries should be greeted with skepticism. There are about a thousand undefined entries in a list of "non-" words, more than a thousand in the un- list, and several thousand more in sixteen additional lists. If it occurs to you to seek coscenarist in the co- list, these lists might be of use. There are also a great many highly technical terms, such as ethylenediaminetetraacetate(s); writings that might contain these are apt to contain quite a few terms not found in this or any similar dictionary. Nonetheless, MW11 looks pretty good after a comparison of a few random pages of this dictionary with the corresponding parts of four similarly-priced dictionaries. At least two competitors have such entries as blank endorsement, blankety-blank, terra alba, or blague, but most or all omit such MW11 entries as: term of art, blanket chest, or the adjective terminate. Recently I found the word Atropos in a 1950 New-Zealand/British novel; it's not in MW11 (except in atropine's etymology), but was found in the competitors; on the other hand, only MW11 offers an explanation of what people who quirk this or that in a (usually) British novel are doing. Definitions are sometimes a little unclear. The 85-word definition for gyroscope is apt to set your head spinning, and you may need to reread it to determine a gyroscope's purpose (I'm not sure it says). There's a sensible usage note for "hopefully", but MW11's appeal to "disjuncts" is less likely to persuade than the competitors' references to "sentence adverbs" or something similar. Many more illustrative examples would help. One appendix contains foreign words and phrases; it's unclear why "a la mode" or Weltschmerz are in the main listing with "a la page" or Weltbild in the appendix. Other appendices list biographic and geographic entries, so, confronted with an unfamiliar proper noun, you may be unsure where to look. Gretna Green, is that biographical or geographical? (Neither, but MW11 has it nonetheless.) These appendices suit the publisher, since during MW11's life there will be new censuses that affect the geographic entries and deaths, elections, awards, etc., that affect the biographic entries, and Merriam can reset the relatively few pages of the appendices more easily than many pages of the main listing. Nonetheless, it is inconvenient for the user. The final page contains the addresses for the Language Research Service. The introduction to MW10 informed us that there is no evidence for the form "merer", so years ago I sent the LRS their first citation; it happens that OED provided another, and an Internet search for "even merer" provides four more, but MW11's introduction still claims that there is no evidence for it. LRS is better at providing information; it gave me a Robert Frost citation to accompany my grandaunt's expression "the cat wanted the guest to make of her". A nice feature is the date of earliest known appearance for each word. MW11 extends this to words like "jehu" that come from a proper name (less clear is why Jehu is in the main listing rather than the biographical appendix), though possibly the date applies to Jehu rather than jehu. Similarly, the date for clueless applies to its literal use, not to the modern idiomatic use whose date might interest you. Definitions are given in date order, so you can usually see how meanings develop over time. Most unfamiliar words have only a single definition, or the unfamiliar meaning you seek may be the oldest, so this is a win-win feature for the user. The dictionary comes with a wonderful CD (optional at higher price), with which many objections disappear. It is much harder to find coscenarist, bo, ked, or Gretna Green with the print edition than with the CD, which incidentally expands abbreviations. You can locate all entries having a usage note containing the word Scottish. Unfortunately, there does not seem to be an easy way to search for all occurrences of Scottish in definitions, etymologies, and usage notes simultaneously, though there is a cumbersome way to do this with an advanced search. It seems pronunciations aren't searchable beyond rhymes and homophones, so for example you cannot find all words with the rare sound that ends "smooth", or all pronunciations marked with the obelus (division sign) that indicates controversy. (Merriam is invited to add the obelus to the first pronunciation of bruschetta, which deviates from the Italian.) With the CD you can also find the other 27-letter single-word entry, the longest word(s) with no repeated letter, the anagrams of abcdeflos or Minnesota, or all words whose earliest known appearance falls in a particular year (the most recent appears to be 2000, for tanga, the Tajiki "cent"); if solving crosswords, you can find words of the form ?p??m?. Best Print Dictionary I've Ever Used! I also have the Oxford dictionary, but from what I've seen of that, it's more a dictionary of BRITISH English than American English. For AMERICAN English, I don't believe the Merriam-Webster's Collegiate can be beaten among the print dictionaries. 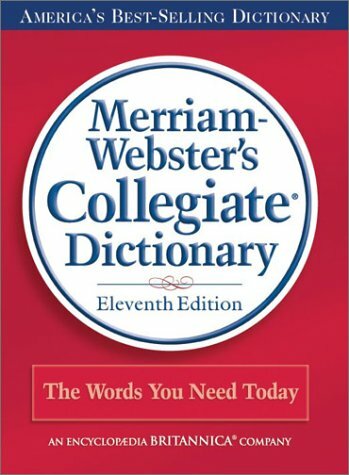 The eleventh edition of the Collegiate Dictionary merges print, CD-ROM and internet formats into a single package. The new format provides definitions to more than 10,000 new words and sense from many fields of knowledge. There are 165,000 entries and 225,000 definitions in an accessible and flexible desktop package. There are more than 40,000 usage examples, coverage of 7,500 phrases and idioms and more than 700 illustrations. It offers word guidance by providing synonym paragraphs that differentiate between shades of meaning. Best of all, the eleventh edition comes with a free one-year subscription to Merriam-Webster's premium web site. This edition of the M-W's Collegiate Dictionary sets a completely new high standard for American dictionaries and in fact -- for any reference book anywhere. This dictionary is everything that a good reference book should be -- self-contained, complete, easy-to-use, extremely well printed, and perfectly consistent. The abbreviations are not overused, the definitions are clear and exhaustive. Inflected forms and alternate spellings are easy to locate and identify. The usage and synonyms notes are of an enormous value for anyone who reads or writes English, and for me it clarified many meanings and different usages (i am not a native English speaker). Another great thing is that the editors treated the etimologies with due respect, so even though this dictionary is supposed to be "abridged", it is very complete. And the quality of printing is so wonderful, that i enjoy reading this dictionary just for fun. Although it is called "Collegiate" it is useful to any person of any age and background, not just for college students. Needless to say, it never disappoints when i'm looking for words. I just got my Merriam-Webster's Collegiate Dictionary, Eleventh Edition from Amazon and am looking forward to getting to know it better. Past editions of the Collegiate have been in many ways excellent, expecially in the clear, crisp definitions and well-researched albeit brief etymologies. It appears that this edition is no exception. My summary impression is that this is a dictionary well worth buying, perhaps the best desk dictionary one can find. The Collegiates, including this one, have been bit quirky, especially as regards pronuncation. For example, this dictionary has a strange relationaship with the schwa sound. In previous editions thre were many apparently inadvertent switches between the schwa (last vowel sound in "circus") and the short u sound (as in "but"). In this edition, however, there are four different sounds (including the short u) that are indicated by easily confusible variants of the schwa symbol. In addition, the "a" vowels in marry and Mary -- distinguished by many mainstream speakers of American English -- are left undifferentiated, as in previous editions. As in previous editions, a key to pronunciation symbols is provided on each recto page. Unfortunately, this little list omits perhaps 2/3 of the list of pronunciation symbols that fill one page of the front matter (making it hard to find each time you need it). Another frustrating aspect for most users *was* that at least in the Tenth Edition, the oldest and often least-used definition of a word was listed first, causing your search for a certain definition usually to be more work. It *appears* that this practice has now been abandoned with the Eleventh Edition, though I haven't found any explicit reference to it in the explanatory notes. If so, this will noticeably improve the ease of using this book. Printing-wise, it appears that the darkness of the type has deepened in the Eleventh Edition (although this may just indicate where in a given press run my copy happened to come from). This makes my 11th Ed. distinctly easier to read than my 10th Ed. In addition, the main entries are now in sans-serif type. This isn't necessarily an aesthetic improvement, but far more important is that it makes finding your word easier on the eyes. Unfortunately, as with the previous edition, the inner margins are too narrow, forcing one to read the right side of a left-hand page and the left side of a right-hand page from paper that is curving into the crease in the middle of the book; almost nothing short of breaking the binding is likely to counteract this problem. A personal prejudice I have (that you may not share) is that I believe a dictionary owes its readers more than just a description of how language is currently used. (Some of current usage is in my opinion poor, and a dictionary is the right place to try to stem the tide of poor usage instead of merely describing it.) The Eleventh Edition, like recent previous ones, has many Usage Notes at the end of an entry. I find these to be by and large too permissive, giving excuses for much questionable usage (while prudently reminding the reader that if they go ahead and employ some usages that M-W deems perfectly acceptable, they may be in for some criticism). For example, one usage note supports the use of "literally" to mean "virtually". Another usage note supports the pronunciation of "nuclear" as "nucular" (lamely trotting out the fact that it has been used that way by members of many respected professions, including U.S. members of congress and even two U.S. presidents!!!!!). If you're like me and you have need for a dictionary on an almost daily basis then you probably want one that you can rely on. This text fits the bill and then some. My preference for M-W dictionaries is in the way they present words according to documented and common modern usage. Unlike some other dictionaries that try to dictate the meaning and use of words this dictionary allows for a bit of the current fashion to enter into the picture. This isn't to say that every new bit of jargon or slang is offered, but rather that if documented instances of a word can be found then it is included along with a meaningful definition. That makes this a true everyday dictionary that you know you can count on. The enclosed CD-ROM is also useful if you want to have the entire dictionary installed on your computer. It's easy to install and isn't a big resource hog. So you can leave it running all the time if you want. Perhaps my only complaint with this edition lies with the thumb index cutouts on the page edges. For whatever reason the letters shown don't match up with the section of the book you get. So when you put your finger in and flip to the 'S' section you don't quite get to the start of the 'S' words. :) It's annoying, but not a show stopper. In the era of online education, chatrooms, Websites and the Internet, something old has become new again--spelling and grammar. The ability to express oneself clearly, fluently and conherently have become more important, as people use the written language to communicate. If you want to do it right, get the hardcover, heavy book. The print is bigger, it has illustrations, historical and cultural derivations of words and it makes your work space look smart. It will be utilized by everyone in the house, and it sets a good tone for kids and grandkids alike, about good spelling and grammar. Excellent on Mac OS X and what value! Not only do you get a terrific print dictionary, but you get a terrific CD which installs flawlessly unto your Mac or PC, and the software really does support OS X, as well as Windows. The interface is great looking, and has a lot of useful features after you figure it out. The help is excellent. The CD contains the "back of the book material" from the dictionary also, such as the manual of style, and the biographical names. A nice touch. Much better than the CD that came with the Concise Oxford Dictionary which only had Windows install anyway. I have both now, and am so glad I also have the print editions! Being a user of Merriam-Webster's Collegiate Dictionary for about 20 years, I am disappointed with this new edition. To be more specific, I am disappointed with the free CD-ROM came with the dictionary. Using dictionaries for me means sitting in front of a PC monitor with fingers on keyboard. When I can find the definitions of words in less than a second, why should I waste 20 to 30 seconds in turning the pages. Accordingly, my review here focuses more on the interface of the CD-ROM dictionary than on the contents itself. In my PC, I installed Collins Cobuild ver 3.1, Longman Dictionary of Contemporary English 4th Edition, Macmillan English Dictionary, ver 1.1, Cambridge International Dictionary of English ver 1.03, The New Penguin English Dictionary 2001, The American Heritage Dictionary 2000, Random House Webster's Unabridged Dictionary ver 3.0, Bookshelf 98, and Merriam-Webster's Collegiate Dictionary & Thesaurus, Deluxe Audio Edition ver 2.5. On another hard disk, I had an older Oxford English Dictionary on the legacy Windows NT 4.0. I have virtually all CD-ROM dictionaries available in the world. For this reason, I would say MW11 CD-ROM still has much to be desired. There had been the MW Deluxe Audio Edition ver 2.5 installed in my PC. When I tried to install the free CD came with MW11, I was requested to remove the ver 2.5. Unfortunately, the ver 3.0 free CD is a dumb one, which ironically expelled the deluxe edition. I later tried this on another hard disk, on which ver 2.5 could be installed after ver 3.0 had been installed. Both versions could coexist harmonically. With multi-version CD-ROM dictionaries running in my PC, I can easily learn that the wonderful features with this MW11 CD-ROM mentioned by other reviewers were just old ones in most of the others. MW might never know how fancy and user-friendly the other CD-ROM dictionaries are, how colorful the others are, and how fast the others are running. MW might never know corpus integration is now a trend in making CD-ROM dictionaries. MW might never know audio function is now a must for CD-ROM dictionaries. The free CD-ROMs came with LDOCE, MED, and RHWUD have wonderful audio function. LDOCE and MED even contain both British and American accents. Some other awkward designs worth mentioning here are that for continuous looking up in this CD-ROM, one has to use mouse to highlight the searching box prior to a new search, which is very annoying when you are looking up a lot of words. On Cobuild, CIDE, MED, etc, you just key in work, then press Enter. Repeating this sequence, the definitions were retrieved one after one, and the searches keep going without a single move of the mouse. For the same word, you have to toggle between dictionary and thesaurus, followed by a click on Search button to retrieve the contents in either reference. On Bookshelf 98, and Cobuild one search can retrieve all the information in each reference. For several decades now, THE MERRIAM-WEBSTER'S COLLEGIATE DICTIONARY has served as the standard American English dictionary. I have done a good deal of copyediting over the years, and every publisher I have worked with has specified this dictionary (along with the Webster's Unabridged) as the standard governoring the way that American English words are spells and defined. Although one can feel overwhelmed by the sheer number of dictionaries in the reference section of any good bookstore, this volume is as close to authoritative as we have in the United States. One might have a preference for another, but this is the only one that enjoys widespread authoritative acceptance. The dust jacket explains the ways that the new 11th edition has been expanded, but personally, while I am quite certain that it has been expanded, I have not noticed a great deal of difference from the 10th edition. It may be definitive and improved, but most of the improvements will be difficult for anyone to detect. The new CD-ROM included with it, however, is a vast improvement on the previous software that was developed based on the 10th edition. When the 10th edition first came out, CD software was not widely available. A CD version of the dictionary did eventually come out, but it was somewhat rudimentary. The new CD-ROM, however, is a huge improvement. For instance, when looking up any word, a column will display a number of words that approximate the word that your are attempting to look up. If you can merely approximate the spelling, you can frequently find the correct word. Furthermore, by double clicking on any word in the online dictionary, you will pull up the listing for that word. The CD-ROM also has a link to the Internet. Unlike prescriptive dictionaries such as the American Heritage Dictionary, which rely on self-appointed panels of "experts" to decide what correct usage should be, descriptive dictionaries such as this and Merriam-Webster's Third International try to keep pace with how the language is actually used by speakers. This may explain why the Webster's Collegiate dictionaries have been the standard reference in the American publishing industry for a long time. This is easily the best dictionary of its class, period. It has an extraordinarily large number of entries and its definitions are concise and easy to understand. The only shortcoming is that there are few example sentences, but this is a necessary tradeoff to keep the size under control. For sheer richness of information it doesn't compare to the New Shorter OED, for example, but then again you can't toss the NSOED into your backpack and take it to school with you. This book is light and compact. But the thing that really sets this dictionary apart is the CD-ROM. You can search for words using up to 15 different operations, including "rhymes with," "is a cryptogram of," "homophones are," "etymology includes," etc. You can use AND and OR operators to combine the various operations. These search functions are a tremendous asset to anybody who works with words, particularly writers, poets, and songwriters. And did I mention that you get a free one-year subscription to their online dictionary with your purchase? This is the reference ! I am a student at University and English is my second language. I choosed this dictionnary because it has so much information about words. From pronunciation to origin of the words while giving rules and exceptions....everything is there. It is more than a traditionnal dictionnary. With it, natives from US or other English speaking countries as well as people learning the language will get everything on their hands. The CD included is very easy to use and so useful when working on a computer. The search engine is powerful and you get at leat 10 options on how to look for words or expressions.